Along with the electric vehicle (EV) boom in China, the amount of EV batteries is increasingly growing, which leads to a dual challenge for waste batteries regarding disposal pressure and recycling demand. However, so far, EV battery recycling has not been industrialized and a recycling network not been established in China. In this paper, a SWOT analysis approach is employed to summarize the scrap battery recycling situation in China and sum up the main factors of these four aspects (Strength, Weakness, Opportunity and Threat). Then an Analytic Hierarchy Process (AHP) method is adopted to assess these factors by weight coefficients. Finally, a TOWS method is used for making development strategies according to the key factors and their weights. The overall strategies include the five aspects laws, economics, system constructions, technology and public education and could be useful for China to promote its EV battery recycling management in the future. 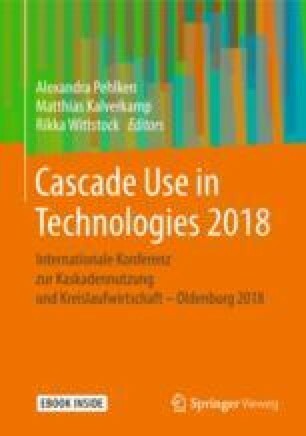 The authors express their sincerest thanks to the National Natural Science Foundation of China for financing this research within the program” Fundamental Research on Catalytic Gasification of Automobile Shredder Residues (ASR): Mechanism and Its Recovery” under the Grant No. 51675343.